If you’re wondering why fat birds are spurning my bearded irises here’s why! We’ve had a lot of rain this summer and the bearded irises in our garden have come into bloom again. In fact the leaves have shot up to twice their previous height. However, although the flowers themselves are not quite the standard of the spring blooms they are displaying on longer stems. There are so many little things in Nature that can inspire us and make us happy. One would think that all we need to do is to become aware of them. But it isn’t so easy because we are mostly programmed into thinking that only the big prizes are worth writing home about. Like buying a new house, getting a new car, going on a long-awaited trip or buying a computer, an ipod or an iphone. Sure these things can make us happy while they’re new and before they lose their novelty. But what a lot we miss by failing to appreciate the little things in nature. Our gardens alone can provide us with more inspiration than we will ever need – if only we allow ourselves to be more observant and aware. Just looking out of the window this morning I saw a pair of black collared barbets starting to build their nest in an overhanging branch nearby. With their lovely red breasts catching the early morning sunlight they were a joy to behold. They were so lively, energetic and totally absorbed in what they were doing that they were quite inspiring. What an example of complete concentration! When we become alert to those seemingly insignificant things in nature that are all around us – we start to notice them more and more. I think that this type of awareness is so important that I want to start a competition about “Getting Inspiration from the little things in Nature”. So in the comment box below, write and tell me of any little inspirational event in your everyday life and the effect it has had on your outlook. 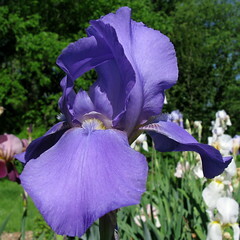 A little while ago I wrote about my prize irises being decapitated by birds. It seems that birds simply can’t resist the irises. But it’s frustrating me no end. I have had the actual flowers eaten off at the base of the flower so that all the petals fall to the ground. The birds don’t seem to want the flower at all, just the juicy bit below. So today I thought of a plan. I would shield the flowers with tin foil. So I grabbed a roll of tin foil and proceeded to give each iris bud a protective collar so that the flower could emerge but that the juicy calyx would be protected. I didn’t have to wait too long for the result of my experiment. I went inside for lunch, and when I came out to view my handiwork, there lay the tin foil on the ground together with the bitten off iris buds. The birds had simply bitten off the stem below the tin foil. But I haven’t given up yet. I’m determined to devise another plan and I’ll keep you posted as to my success or otherwise. Meanwhile, if you have any suggestions please send them in. I will be ever so grateful! Help! My Prize Irises are being Decapitated by Birds. If you’ve never seen what an iris looks like after the birds have been at it – I can tell you. Decapitated” is the first word that comes to mind! No sooner does an iris starts to show colour and begin to open than I find it lying in tatters on the ground. Even the side blooms get decapitated one by one. Snapped off at the base of the flower with only a few ragged remnants lying on the ground to taunt me. Birds that eat irises certainly have good taste. They can’t be faulted on that one. But why don’t they rather go for the dainty little lobelias or some other tasty flower nearby? Why are they choosing my prize irises? To make matters worse, no one has heard of my particular gardening predicament. They find it very funny and think I’m joking! Fortunately for the birds I have an organic garden so I don’t use poisons. And even though there are times when I could cheerfully roast those birds for our next Sunday lunch I don’t really want to hurt them. So this is an urgent S.O.S. If you have had any experience with birds eating irises please get back to me in haste. If you have any suggestions I would be more than grateful. S.O.S. Help me save my irises!